Announcing another improvement to our Twitter engagement analytics! Your engagement data is now updated in real time in your Trackers and we’ve added even more to help you better understand your Twitter performance. Our Twitter account Trackers now feature the first real-time engagement data for Twitter. 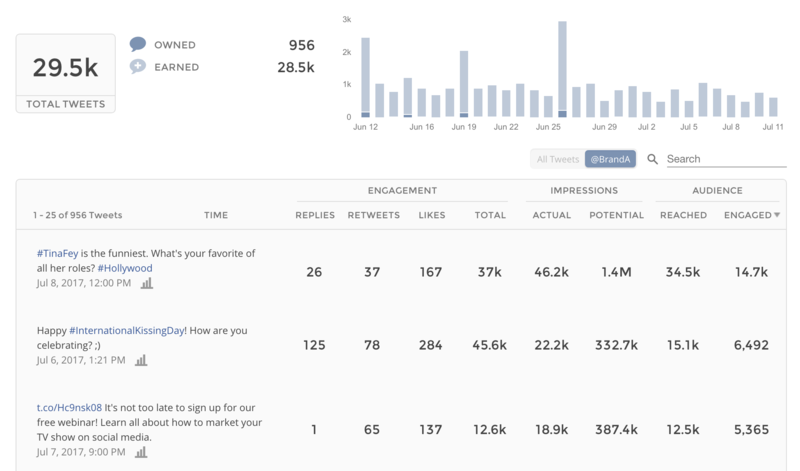 You can now also see actual reach and unique engagers for each of your Tweets, alongside actual impressions, likes and clicks. Get real-time updates, detailed reporting on all of your posts, and learn exactly how you’re doing on Twitter and where you can improve. All of this now in Union Metrics right next to your campaign analytics, social listening, and competitor tracking. You’ve never before been able to see your unique actual reach right next to the number of engaged users for a given Tweet. Finally, you can see exactly how effective your Tweets are – not just how many people see them, but how many people actually do something with them instead of just scrolling past. This gives you an unprecedented opportunity to see what’s actually working for you on Twitter, and what could be improved. Use this to learn how you can do better. And Union Metrics can help. These updates are only available in authenticated Twitter account Trackers for active Union Metrics subscribers, so be sure your Trackers are set up and you’re not missing anything! Log in to your account now. And if you need more information about what’s included in our engagement reporting, read this on our helpdesk. We’ve updated a lot of our owned Twitter analytics over the past month, and all authenticated Twitter Trackers now include actual reach and impressions, likes, clicks, real-time updates and more. Don’t have a Union Metrics account yet? That’s easy to fix. Sign up now – plans start at just $99 a month.